This tool allows one to visualize the output of the Lippmannian device as a network with Gephi. Specifically, this tool generates a GEXF file with nodes and weighted edges. The nodes are both the queries as well as the URLs inputted in the Lippmannian Device. Each request to the Lippmannian Device to Google will result in an edge between each query and URL inputted. In the GEXF file, the edges are weighted either by the number of Google results scraped, or as indicated by Google (i.e. the number under the search box on a Google results page). In Gephi one can resize the nodes based on Average Weighted Degree. This will effectively combine a node's degree with the weight of the connected edges. By applying this to the output of the Lippmannian Device one is able to see the most important query/URL combinations for a set of queries (issues) and URLs (actors). Download and install Gephi and check for latest updates under 'Help'. Start a new project in Gephi and open the GEFX file. In the filter window, go to 'edges' and drag 'edge weight' to 'queries' in the bottom part of the window. Click "Edge Weight". If you selected 'Number of scraped results' in the GEFX generation step, filter out edges with a weight smaller than 2 (default). If you selected 'Google estimate', make sure to filter out edges with a weight smaller than 1. In the layout window, choose 'force atlas'. Increase the 'repulsion strength' to 2000, possibly tick 'attraction distribution'. Click 'run' and wait until the network has stabilized. In the statistics window, click on 'run' next to 'Avg. Weighted Degree'. Click 'close' on the pop-up window. In the ranking window, click the little red diamond and choose 'weighted degree' as your ranking parameter. Set your min and max sizes to something reasonable. Click apply. In the partition window, click on the refresh icon. Select 'node-type' as your partition parameter. Choose colors. Click apply. In the main window, click on the black 'T'-icon (show node labels). Click on the black 'A'-icon (size mode) and select 'node-size'. In the layout window, choose 'label adjust', make sure all labels are visible and click 'run'. Click 'Preview' mode at the top left. Finalize your visualization by clicking 'refresh' and see the results as well as export to PDF. 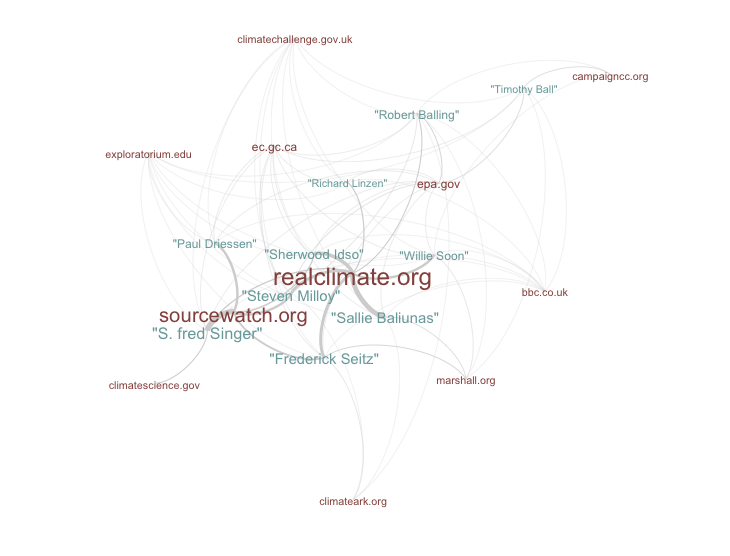 The networked tag cloud shows the relative position of the climate change skeptics in relation to the sources that mention them. The Lippmaniann device result file from the 2007 Climate Change Skeptics project was used for this visualization.